Central River Division (formally MacCarthy Island Division) with an area of 3038 sq. km is the largest Local Government Area in the Gambia. The division consists of 10 districts including MacCarthy Island with the headquarter in Janjanbureh (formally Georgetown). Because of difficulties in logistics between the north and south bank the division is sometimes considered as two Local Government Areas, with Kuntaur the de facto headquarters for the north bank and and Janjanbureh the headquarter for the south bank. Formally called Lemaine Island, the island was purchased by the British Crown in 1832 and renamed MacCarthy Island after Sir Charles MacCarthy, the English governor at the time. Shortly after, a Fort and trading post were built on the Island. Up until the late 1960’s the Janjanbureh was the unofficial “upcountry capital” with the countries only boarding school. 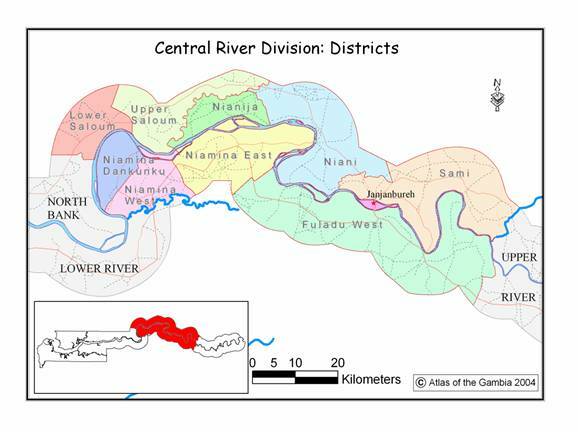 Since Independence, however, Georgetown has slowly lost to Bansang as the Division’s de facto economic capital primarily due to inaccessibility to the Banjul and the rest of the country. Like the rest of the Gambia, accessibility to Banjul and Kombo, seem to influence the pattern of infrastructure development and population distribution. The CRD south excluding Georgetown occupying only 46% of the Division’s land area has 56% of the population. Since 1973 the proportion of the Division’s population located in the South Bank has increased steadily from 53% to 58%. Central River Division as 10 districts including MacCarthy Island. Fulladu West is the largest and most populous district in the Division. With only 26% of the land area, the district is home to 39% of the total population in 2003. Figure 4. Distribution of Division Population in 2003. Source. Central Statistics Department, Gambia. Figure 5. District Population in 1993 and 2003. Source: National Population and Housing Census. Department of Central Statistics, The Gambia. Armitage High School, the nation's only boarding school is in Janjanbureh. Armitage was established in 1923, as a place for district chiefs to send their kids to school. As a result many of post-independent Gambian leaders were alumni of Armitage High School. Until the 1990s Armitage was the only institution of Higher learning in the Division leaving large areas of the division without basic education facilities. Central River Division is most notable for it livestock and rice lands. With extensive freshwater floodplains on either side of river, the division is ideal place for livestock production and irrigation farming. With a majority Fula population, a group synonymous to cattle ownership, it is estimated that over 50% of the countries cattle live in Central River. Since the 1950s the Division has played important role in agricultural development in the Gambia with the country's first agricultural training training centers established in Fula Bantang and Sapu. Fula Bantang was used for training farmers in the use the ox-plow and Sapu used as experimental station in rice production. Since then successful governments has focused on irrigation rice production in Central River as the nation's only hope to achieving self-sufficiency in food production. Jahally-Pacharr irrigation project and more recently the Lowland Agriculture Development Programme (LADEP) are few of the major agricultural irrigation projects in Central. In addition to rice and livestock production, central River Division is second only North Bank Division in groundnut production. The extensive floodplains and relatively low human population density also meant that Central River is the countries last frontier to biodiversity preservation. The Division has the only largest resident wild hippopotamus population. In addition, the Chimpanzee Rehabilitation Center is in Central River. The Chimpanzee Rehabilitation Center was created to help help return orphan Chimps into the wild. As a result the Division has the only wild Chimpanzee population. Also the Division has one of the remaining intact wetlands in the country attracting a significant number of migratory and resident bird population. 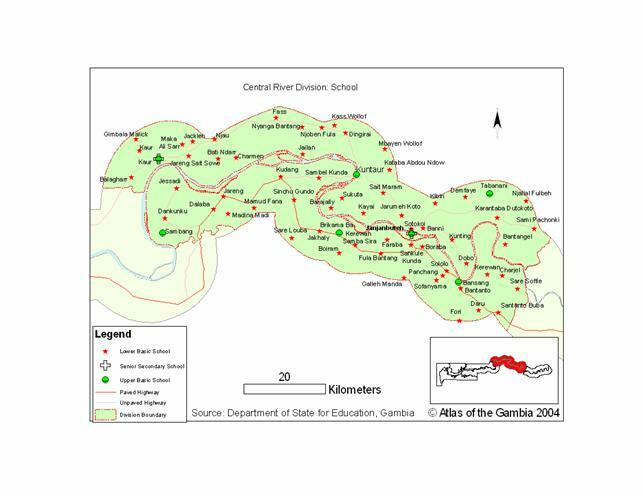 Central River has the largest concentration of the Stone Circles and shell mounds in the Gambia. The largest of the Stone Circles are located in the north bank of the division, Wassu circle the largest and most famous in the country.